One of the most popular things these days amongst elementary school kids are emojis . Despite many of these kids not even having access to things like phones and messaging that actually uses emojis, they love them. Stuffed emojis. Apparel with emojis. Games with emojis. Jewelry with emojis. They seem to love the big bright yellow expressive characters that we use to illustrate our emotions via normally dispassionate text-based messages. With Valentine’s Day right around the corner, and teachers already sharing classroom headcounts and lists of names for Valentine’s Day cards , I figured it was a fun idea to make cards for my daughter to hand out this year. And what better theme than emojis? 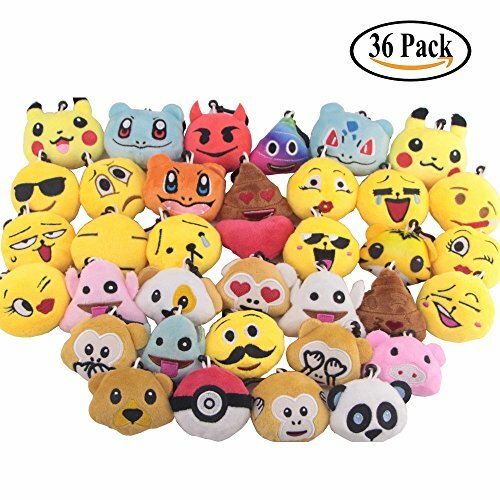 Swity Home 36 Pack Mini Emoji Plush Pillows, Mini Keychain Decorations, For Party Decoration, Party Supplies Favors, Set of 36 As I was creating the designs for the cards, my daughter was brainstorming how she was going to attach candy to each Valentine card. When I was a kid we handed out cards and that’s it. Now, these kids have upped the ante and really made it more challenging for us parents. And more expensive. But since I was making the cards I figured I had to do something so I went in search of some small emoji toys because I’d really prefer not to contribute to other children’s dental bills. These cards can stand alone or you can buy some mini emoji plush keychains to attach to the cards. <—— These are the ones I bought. They are much nicer than I thought they would be, super soft and high quality and very cute. I know the kids will love them, I might even keep one for myself. I made 24 different emoji Valentines to correspond with many of the plush emojis. I know a lot of kids really like the brown spirally emoji meant to illustrate a body function. They even make them in rainbow colors now. As a parent, I feel there are plenty of other adorable and expressive emojis and could really do without the emoji poop. So you won’t find any valentine’s day cards here with poo on them. I just didn’t think it was appropriate, especially because of the propensity for kids to be mean or inadvertently hurt someone’s feelings. I wasn’t overly keen on the devil one either but my daughter assured me that the boys would like it so I left it in. It’s up to you to decide if you use it or not. It’s easy to print these out. I have a PDF file that you can download and print. I recommend that you print them on cardstock so that they are more durable. You can leave them as-is or punch holes in the top to clip the emoji keychains to if you buy them. They can write their name on the front or the back, whatever they choose. This is a nice non-candy Valentine alternative. Below you can see all of the designs. Don’t forget to pin this on Pinterest for later if you can’t print it right away! Thank you for sharing these! My fifth graders will love them!